WHOA. I was utterly unprepared for the Gold/Silver ratio dropping two percent to 70.808, gapping down hugely below its 200 DMA at 71.44. Oy If y’all are EVER going to swap gold for silver to take advantage of the coming huge drop in the ratio, now is probably your last chance. Gold Price leapt $25.80 (2.16%) to close at $1,218.40, top of its range. The Silver Price doubled that, up 4.22% or 69.7 cents to 1720.7 cents. My daily gold price chart doesn’t agree with what my eyes saw today. When I first looked at the gold price this morning about 10:00 a.m. (11 Eastern), it was already above $1,214. Excuse given by the media is that lower US retail sales bumped down the dollar and up gold. This makes some sense to me since the dollar index began falling about 8:30 this morning. But what’s wrong with that picture? Disappointing retail sales did all that damage to the dollar? Naw, it broke through that 94 support. And gold has been tugging at its leash for a week, trying to rise. Well, today it succeeded. The gold price cleared its 50 DMA ($1,188.45) and jumped clean over $1,200 and old resistance. In fact, its 200 DMA is at $1,220.71. Whoa. If the gold price can clear that mark, it will draw buyers like blood draws sharks. 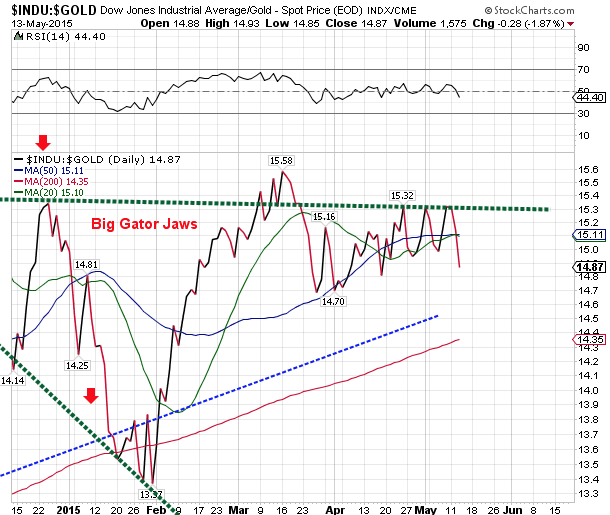 However, gold is trading in a very tight Bollinger Band width and today took it nearly to its 3-standard deviation upper line. Now remember, nothing says that band can’t widen out, and they’ve been trading at their narrowest since June a year ago so they’re ready to spread. Whoa. Whoa! The silver price closed above its 200 DMA (1714c). Cut clean through that old neckline resistance and 1660. Needs only top 1740, the last high. 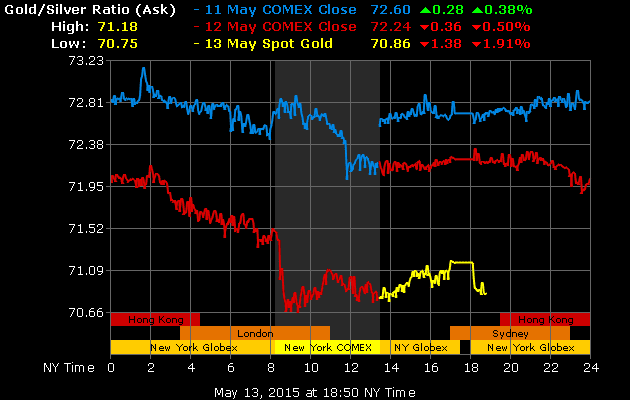 The gold price needs to beat $1,225. Something’s stirring: interest rates are climbing fast, dollar’s stumbling, stocks are frozen, and silver and gold burst upward. Something’s going on we aren’t seeing, something behind the scenes. Nice Government Men won’t be able to sleep tonight for planning tomorrow’s manipulations. As I told y’all, I already bought silver and gold yesterday, but if they clear 1740c and $1,225 tomorrow, y’all had better buy some, too. Chart after chart pressed the same breathless WHOA out of me this afternoon as I opened them. Take the US dollar index: down 85 basis points (0.89%) to 93.76, smashing support barely below 94. Next real support I can point to is 90.34. It gapped up today and left behind resistance at 12.63-12.75. Rose 3.08% to close at 12.99. More than that, the indicators still point further up. WHOA. Even rising 1.17% today to $1.1346 the Euro couldn’t clear $1.14. Ok, give it some credit: that will probably come tomorrow. Yen jumped, too, 0.53% to 83.90 and managed to clear its 20 DMA. Remember it remains in a range bounded by 82.25 and 84.30. 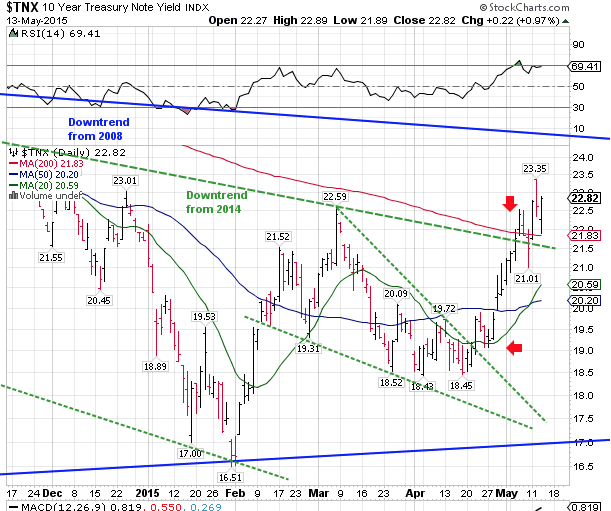 US 10 year Treasury note yield rose 0.97% to end at 2.282%; 30 year bond yield jumped up 1.69% to close 3.0715. The 10 year yield had dropped below its 200 DMA last Friday, after spending two days above it. However, it came back Monday and smashed the 200DMA, made a higher high but backed off yesterday, then nearly touched the 200 DMA today and closed much higher. Classic touch-back behavior that ought to lead to higher prices. Whoops, point of this 200 DMA discussion is that the 30 year yield broke through a week ago, touched back, and then took off. 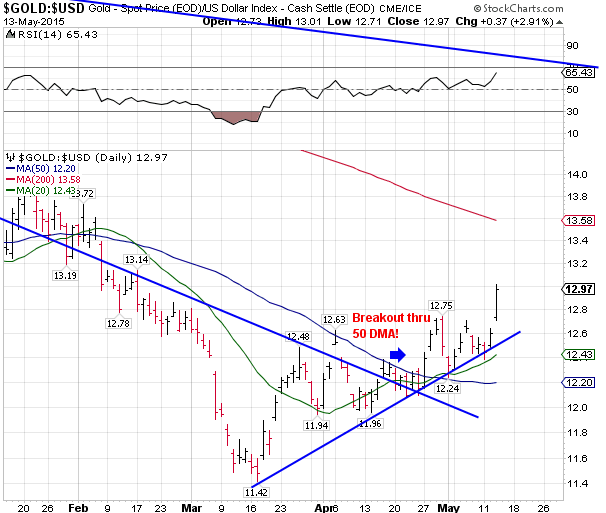 Both are steadily adding confirmation to an upside breakout of interest rates. Wonder if Janet Yellen’s puking in her wastebasket yet? Pepto Bismol won’t help that kind of pukin’, Janet. Stocks made no headway again today, but rather fainted. Dow tried to rise but ended up 7.74 lower at 18,060.49. S&P500 scratched off 0.64 to end up 2,098.48 and below its 20 DMA. 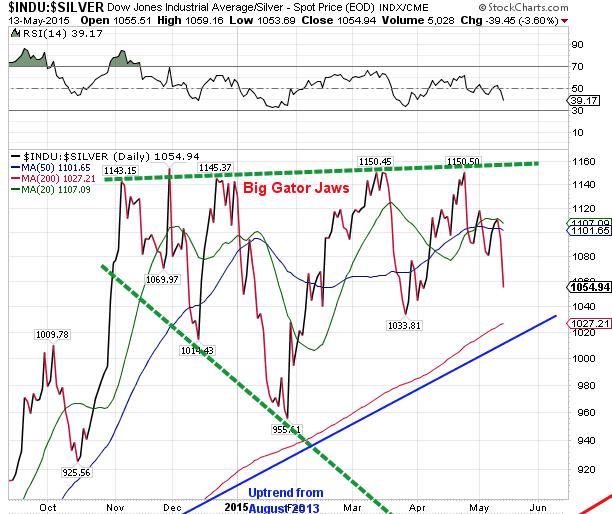 After torturing us again by returning to the upper gator jaw, Dow in Gold fell completely off the porch today, cutting through the 20 and 50 DMA at G$312.14 (15.10) and G$312.35 (15.11 oz). Fell 2.15% to G$306.56 (14.83 oz). Dow in silver fell off the porch and into the briars, down 4.17% to S$1,355.96 silver dollars (1,048.75 oz). 200 DMA awaits at S$1,328.07 (1,027.18 oz).